An archive for lore, mechanics, and more. IndieDB 2015 indie of the year awards! 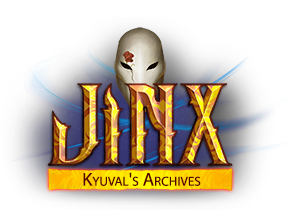 Jinx: An unknown (and unknowable), mysterious mage with a hidden agenda and a lack of words. Colleen: A beastwoman bodyguard with a heavy past. Blood: A bulldog with a sensitive heart and brutally savage fangs. Friends, allies and acquaintances of the heroes. They generally have the benefit of the doubt. Enemies of the heroes, beyond all shadow of a doubt. Probably. An entire Pantheon of entities with an impressive variety of agendas and more than a few reasons to meddle with the world. Cosmogony, and the state of things before the mortal races came to be. The source of every force in the Cosmos. A gloomy, forgotten valley that imprisons all enemies of the Theocracy. See Lore for more information. Jinx's expansive collection of Spells. Blood's most practiced - and most effective - Tricks. Tension Flux, Jinx's release of raw magical energy. Tension Surge, Colleen's adrenaline letting her tap parts of her soul she can't even understand. Tension Vent, Blood's release of pent up frustration into a furious rage worthy of a berserker. Armaments of the chosen, forever tied to their destinies. Shardshaped Crystals, holding the essence of arcane energies to be used at will. Tinkered Trinkets, devices that provide a variety of helpful effects under specific circumstances. Collected Trophies, paraphernalia that remind the best tactics to acquire more. Maladies and other status effects. System mechanics and other details about how the Cosmos works.